When asked, “Is it not possible to live without reciting his divine names?”, AzhwAr says that those who are egotistical and who occupy high posts, exhibit their authority only because they are devoted to him. thirumAlaik kai thozhuvar senRu – they approach SrI mahAlakshmi’s consort and worship. thirumAl – pirAtti (mahAlakshmi) is there to grant the boons sought by each one of them. The dhEvas, who sit egotistically waiting for people to come to their doorsteps to seek alms, rid themselves of their ego and go to emperumAn on their own. Is there a necessity for the dhEvas to attain him? brahmA sUthram 1-3-25 says “thadhuparyapi bhAdharAyaNassambhavAth” (bhAdharAyaNar (a great sage) says that brahmOpAsanam (devotion to emperumAn) is apt for even dhEvas, who are superior to human beings). 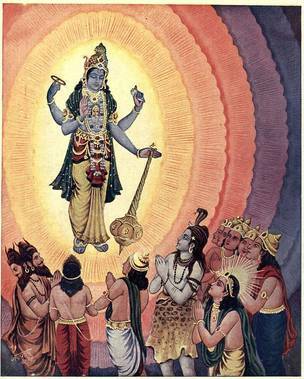 Thus, since it is ordained in vEdham, in order to get mOksham (liberation from materialistic realm and reaching SrIvaikuNtam) at some point of time in future, dhEvas also approach emperumAn who is at the centre of the galaxy and worship him. We shall take up the 53rd pAsuram next. This entry was posted in iyaRpA, mudhal thiruvandhAdhi on August 1, 2017 by T N Krishnan.